Back in October I received an email from Max Factor saying they had an exciting new launch coming in November that they'd like me to try. Curious as to what the launch might be I confirmed my delivery details and eagerly awaited the arrival of the new product. There was a little bit of a delay with it getting to me but as few weeks later the Max Factor False Lash Effect Velvet Volume mascara* arrived. The Velvet Volume mascara is part of a three piece velvet collection that includes the mascara, a Smoky Eye Drama kit (eye shadow) and a Masterpiece liquid liner. The mascara is also an extension to their False Lash Effect line. 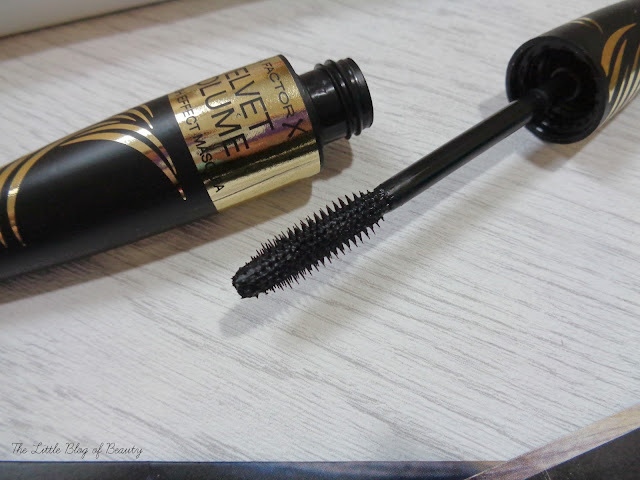 I believe all of the existing False Lash Effect mascaras feature a plastic brush and this one is no exception, featuring a reasonably thick barrel with short stubby bristles. You can just about see that the brush features short and longer bristles, designed to capture and coat each lash. I do currently have the standard False Lash Effect mascara after I received it through the Max Factor/Olay promotion on Twitter a few months ago and comparing the brushes the Velvet Volume one is slightly longer with a thinner barrel. One thing that I did notice about the standard one when I received it was that the barrel is really quite chunky. The 'velvet' part of this mascara is a move that several brands appear to be making now. Max Factor conducted some global research and found that many women find that volumising mascaras leave their lashes looking stiff and feeling brittle. 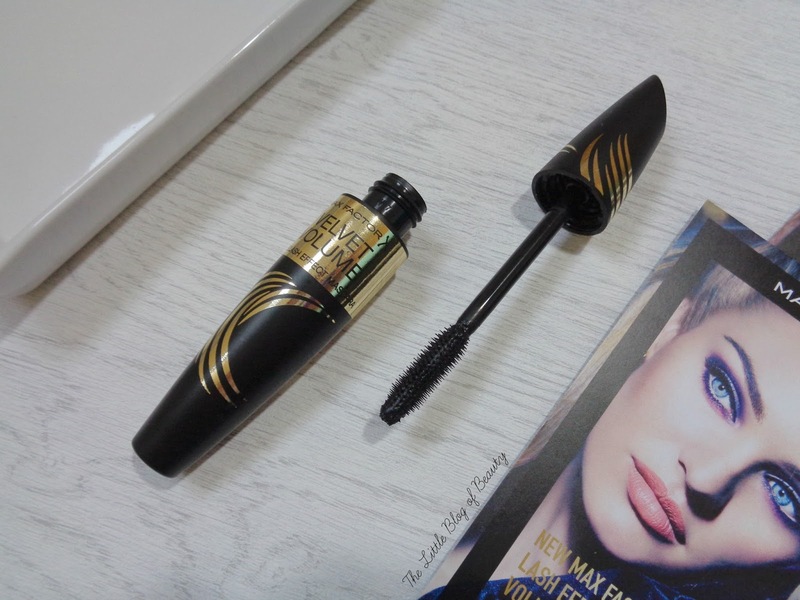 Max Factor describe the formula of this mascara as 'mousse-like' and rather than drying to the hard, crispy feeling finish we're used to with mascaras this stays soft, so it feels more like your bare lashes. The formula contains a combination of natural beeswax and glycerin, ingredients that are used in hair conditioner to keep hair smooth. When I first tried the original False Lash Effect mascara I expected it to provide a dramatic false lash look, as if you're actually wearing false lashes and can tell that you're wearing them, but it doesn't provide a really dramatic effect and neither does the velvet version. Instead I find it similar to my favourite mascara, They're Real, and find that it separates, lengthens and defines each individual lash. I'd say it's quite a natural but lengthened and defined look rather than the full and fluttery look I was expecting. Although it is nice to touch your lashes and them not feel crispy and coated in dried product, I don't actually touch my lashes very often, unless I forget I have make-up on and rub my eye, so I'm not sure whether soft feelings lashes is actually needed. However, Max Factor did find that women complained about crispy lashes, so maybe it is something people want. As long as my lashes don't look crispy and spidery and clogged up with mascara then I'm happy. But overlooking that it is a very nice mascara and although I would say I would go for the standard one because I'm not that bothered about the velvet feel, I actually prefer the thinner barrel on this one. So I would chose this one over the standard one and the soft feeling lashes would be a nice extra bonus if I decide I want to stroke them. The Max Factor False Lash Effect Velvet Volume mascara is £11.99 and is available from Boots. You can find details on Max Factors entire mascara range on the Max Factor website. Would you use a velvet feel mascara? Lovely review! I am intrigued by these new velvet mascaras - will keep an eye out for this one! Ooh this mascara sounds interesting! I don't think I've ever tried Max Factors mascaras so maybe I'll give this one a go. This mascara sounds awesome, i really need to get into max factor. Great review! It sounds really good. Ooh if this is a dupe for They're Real I may have to give this a shot! I agree though, not sure the velvet thing is something that I am that bothered about.